November Is Adopt a Senior Cat Month! Last month, we lost our family cat Sassy. She had been with us for 16.5 years and though she was a senior cat, her loss was sudden and unexpected - you see, Sassy really lived up to her name. The girl had an attitude, she was talkative, and she loved head scritches - on her terms, naturally. When most people adopt a cat, they're looking for a feline that's young, spry, and full of energy. Kittens and cats at 1-2 years of age have that in spades and require a lot of time, patience, and maintenance. I don't know about you, but I work a full time job. I'm also a chronically ill "spoonie" that doesn't have a lot of time for playing the part of a rain forest tree as my furry companion pretends to be the fiercest panther in all the land. I appreciate a lap cat, someone who will keep me company while I'm parked at my computer - working on blog posts, fiction writing, editing, or just escaping the harsh realities of life via Youtube. Senior cats are often perfect for this. Grown-up pets don’t require the constant monitoring and training that puppies and kittens do. Since senior pets are fully grown, you’ll be immediately aware of important information like personality type and grooming requirements, making it easier to choose the perfect pet for your family. It is a sad fact that senior pets are often the last to be adopted from shelters, putting them at an increased risk for euthanasia. When you adopt a senior pet, you’re not only welcoming a lifetime of love into your home, you’re also saving a precious life." Having spent time with both kittens and older cats, I can definitively say that I prefer older cats. They have defined personalities and idiosyncrasies that are so fun to get to know and it's incredibly satisfying once you finally have a routine with this creature. When you vibe, you vibe - and it's a wonderful thing. 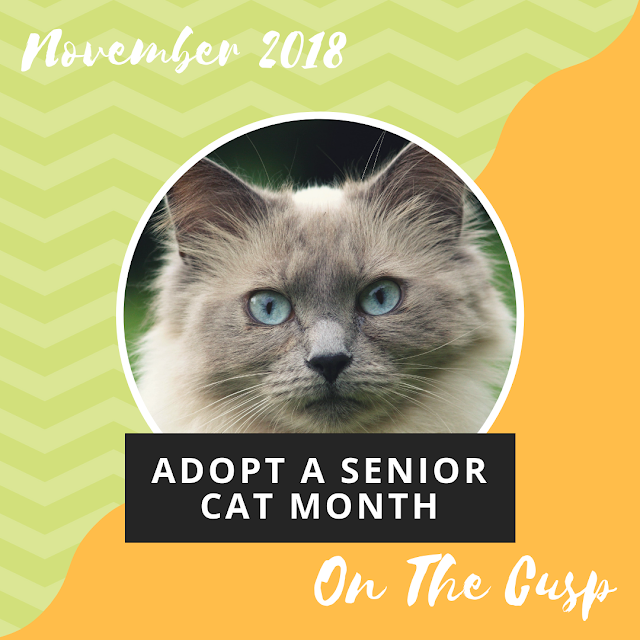 Have you ever adopted a senior cat? I really hope you'll consider it in the future if you ever decide to adopt a feline companion, they have nothing but love to offer...Cheers! I can definitely understand that the loss of a pet can hit hard. I lost my cat a few years ago and I still have nightmares about it. We had actually planned to adopt a senior cat, but by the time we made it to the woman who was trying to find her a home, she had already been adopted, but she had a younger cat for us instead. I think it's wonderful to give an older cat (or dog) a home since, like you said, they tend not to get adopted as easily. Someday, when I'm ready for another pet, I plan to adopt an older creature.